When the text below refers to ”the Company” or ”we”, this is in reference to Stockholm Historic Pub Tour AB. When you have selected to pay with credit card, you will be routed to Payson’s secure payment portal for credit cards. Then you select which credit card you will use (Visa or MasterCard), fill in the card number and the Good Thru month and year. This information is then processed and approved. Payson has high security demands and is PCI-certified by Trustwave, an international organization for safe e-commerce. All traffic is encrypted with SSL 128 bits and all credit card payments are secured by the bank’s 3D-secure technology. To increase security one step further, you will be prompted to include the last three numbers printed in the signature box on the back of your card, CVV2 is Visa’s identifier and CVC2 is MasterCard’s identifier. Other identifiers used as security codes may be referred to as CVV-code, Cvx, or security number. This code is sent to the card owner for verification. If you would like to know more about security codes, contact your bank or credit card provider. Once you have selected your products and chosen to pay via online bank, you will be routed to Payson’s secure payment portal. Then, select which bank you would like to use. You will be rerouted to your bank where you can confirm payment. Payson has high security demands and is PCI-certified by Trustwave, an international organization for safe e-commerce. All traffic is incrypted with SSL 128 bits and all credit card payments are secured by the bank’s 3D-secure technology. If you have a WyWallet account, you can pay via the WyWallet app on your telephone. Start the WyWallet app, select WyWallet as method of payment in the web shop, fill in your cell phone number when prompted, and confirm the purchase with your pin code in your telephone. WyWallet is an approved electronic payment transaction provider by the Swedish financial inspection board. By paying with your telephone number, you need no bank security device and are not required to provide bank card information. You can connect your bank card to your telephone number via the WyWallet telephone app or choose to pay via invoice, a simple, safe and streamlined alternative. You then confirm your purchase with a pin code as an additional layer of security. We accept MasterCard, Visa, American Express, Maestro, V-pay, Electron and JCB. Our partner for these transactions is the Swedish company, iZettle. Read more at www.izettle.com. Either swipe or insert your card into the card reader which is connected to our SmartPhone or tablet. On the screen, you will see the total you pay. Enter your code on the screen (if your card has a chip) or sign on the screen using your finger (if your card has a magnetic strip). If you have not purchased anything using iZettle in the past, you may enter your email address to have your receipt sent to you. iZettle is approved by EMV (Europay, MasterCard, and Visa) and follows the demands in the global ”Payment Card Industry Data Security Standard” (PCI DSS) for secure management of credit card data. All sensitive information is encrypted with advanced encryption algorithms and is protected by VeriSign extended validation SSL certification. Microchip card data is encrypted directly in the card reader and is not stored in the card reader, smartphone, or tablet. In the event any of these devices are stolen from the company, it would be impossible for this information to be recovered. The company’s bank giro number is 568-7314. When selecting to pay via bank giro, you must provide your name and address. The payment must be received by the company before the tour begins. We accept payment via Payson Invoice (PaysonFaktura) in collaboration with Payson AB. Payment terms are 14 days and an invoicing fee of 19 SEK is added to the total. In order to place an order with invoicing, you must be 18 years or older and be a resident of Sweden. You must also be approved during the credit assessment which is automatically implemented at the time of purchase. The invoice will be sent separately via email to the email address you register at the time of purchase. In the event of late payment, we will send a reminder and add an additional fee of 60 SEK to the invoice. We charge a default interest of 2% per month from the invoice’s due date. If the customer fails to pay, the records will be handed over to a debt collection service and an additional fee of 180 SEK will be outdated to the outstanding payment. Payson reserves the right to refuse delivery of services and review the client’s credit value. According to the distance- and home sales law (distans- och hemförsäljningslagen), you as the consumer (excluding businesses) have the right to withdraw from the contract by sending a message to Payson within 14 days from purchase. In order to take advantage of this policy, you must return the product in mint condition in the original packaging. If you select to enact this policy, then you are responsible for the cost of return. Upon the selection of PaysonFaktura, the payment of invoice is pledged to Payson and will then be moved to SVEA Ekonomi AB, 556489-2924. Select this alternative if you have purchased a gift card/voucher) from Stockholm Historic Pub Tour or one of our partners. 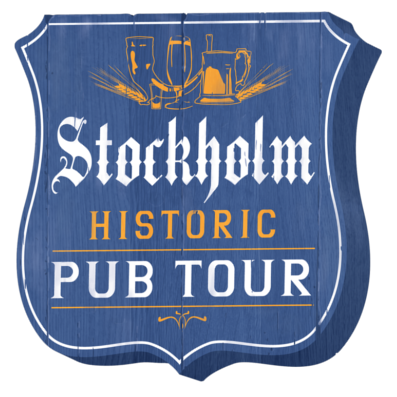 To use gift cards purchased via Stockholm Historic Pub Tour, use the code in the field ”Discount Code” at checkout. There are additional costs for delivery, all costs are included in the sales price. All communication including confirmations and proof of payment received shall be exchanged via email and will be sent as soon as the order has been paid. Gift cards will be sent via regular mail within one (1) business day. For private customers, the Swedish consumer laws (konsumentköplagen) and the distance trade law (distansavtalslagen) apply. Customers under the age of 18 must have their guardian’s approval to place an order with the company. If a participant looks to be under 25 years of age, the guide will ask to see an ID before the start of the tour to ensure that the person in question is of age to purchase and consume alcoholic beverages. According to the distance contract, private customers have the right to withdraw their purchase within 14 days. If the customer has already started a tour, this right to withdraw is invalidated. Refunds are processed within 30 days. For businesses, the Swedish purchase law (köplagen) applies. Same terms and conditions as for private persons, see section 1.1.1. Same terms and conditions as for private persons, see section 1.1.2. Same terms and conditions as for private persons, see section 1.1.4. The company’s bank giro number is 568-7314. When selecting to pay via bank giro, you must provide the name of the business and the address. The payment must be received by the company before the tour begins. Upon sales of services to a Swedish business or organization, payment terms of 14 days from the date of order shall apply. An invoicing fee of 39 SEK including tax will be added to the sum. In the event of late payment, a reminder will be sent. 60 SEK in addition to a default interest of 24% and applicable reference interest shall be applied. Same terms and conditions as for private persons, see section 1.1.7. If a participant appears to be under the age of 25, we will require proof of age before the guided tour may commence. This is the ensure that all participants are of drinking age. Unforeseen events beyond the Company’s control shall be classified as force majeur, which releases the Company from its obligation to fulfill the contractual agreement. Prices of our products are in Swedish kronor currency and include sales tax (VAT). In order to purchase from the Company, it is necessary for you to include personal information in the obligatory fields at the time of payment. The personal information that you share with the Company is used exclusively to process orders, provide Company updates, and for other purposes that help the Company improve services and guarantee customer satisfaction. No information is shared with a third party. We reserve the right to change all information without advance notice. In the event of cancellations that we are responsible for, we will refund prepaid amounts.